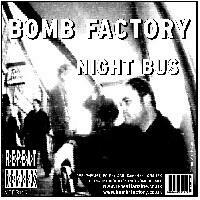 R*E*P*E*A*T Records is proud to announce that the next of its limited edition coloured vinyl split seven inch singles is to be a red hot ranting poetry special starring Attila The Stockbroker and Bomb Factory. Inspired by the spirit and 'Do It Yourself' ethos of punk rock, and above all by The Clash and their overtly radical, political stance, Attila started performing in 1980, blagging spots for his poems and songs in between bands at punk gigs. He quickly got a couple of John Peel radio sessions, a deal with London independent record label Cherry Red Records and before very long was on the front cover of Melody Maker...and he hasn't looked back since! Attila has spent the last 23 years performing his work across the world at literary and music festivals, rock venues, arts centres, pubs, universities, schools, folk clubs and punk squats in the UK, Germany, the Netherlands, Canada, Australia, New Zealand, the US, Euskadi, France, Scandinavia, Austria, Switzerland, Italy, Poland, Hungary - and more improbably in Romania, Bulgaria and a hotel basement in Stalinist Albania. He's created his own global network, organises most of his own gigs (and many for other performers at various one-off events and festivals and at the regular spoken word/music events he runs in his native Brighton) and is very proud to have earned a living as a poet since 1982. 'Baghdad Ska', performed with his band Barnstormer, is a very topical and very angry look at the US occupation of Iraq from the point of view of an ordinary Iraqi citizen. It's taken from the forthcoming Barnstormer album, 'Zero Tolerance', released in April and supported by a full European tour. "We are Bomb Factory. Three men. One bass. A drum kit. A microphone. Punk noise and poetry. Anger and frustration. Bored shitless with off-the-peg, Pop Idol, consumer culture - the Spectacular Society where all you can see are things and their price. A desire to do it ourselves. We want you to do it yourself. Ideas. Passion. Up yours to a trash celebrity elite created in boardrooms to keep you enthralled, passive, obedient. No more icons anymore. Blow it up, burn it down, kick it till it breaks"
The single, which is aiming to raise money for Love Music Hate Racism, will be launched with a gig at The Portland Arms Cambridge on Thursday April 15th and will be available nationwide through Backs / Shellshock / Pinnacle, cat no MBRR115."